It's that time of year - thank goodness! I love Spring! After a long Winter of cold & snow, shut windows, and not nearly enough sun light - this weather is like coming back to life. I've got my windows open and flowers blooming - I'm a happy girl! With this wonderful weather comes time to open the windows, shed the stale, and get things clean and fresh. Spring Cleaning! I got a jump on my Spring cleaning this year getting things ready for my Grandma to come stay with us for two weeks. I got most of my cleaning done and even put a new coat of paint on the kitchen & guest room. With a three storey house, that's a lot of cleaning! Simple Green was with me every step of the way. I started with a 32oz bottle of concentrate and after getting all my cleaning done, which includes wiping down ever surface - walls, floors, counters, cabinets, all of it. I now have about 1/4 bottle left. Non-toxic, biodegradable, non-hazardous, non-flammable, non-corrosive. Versatile, all purpose cleanser. Is concentrate and is diluted based on need - it only takes a little Simple Green to get jobs done around the house. Lasts far longer than ready to use brands. Simple Green feels really clean and feels like a healthy choice. I love the clean earthy scent as well. 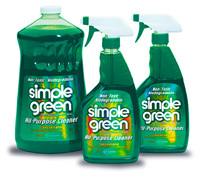 Simple Green can replace most cleansers, detergents, degreasers, & laundry pre-soaks you're using now! Let Simple Green help you bring Spring fresh to your home! One lucky winner will receive a Simple Green concentrate prize pack which includes a bottle of concentrate & a Simple Green spray bottle to mix your dilution in. *Follow me @jamaise at Twitter & Tweet this : RT @jamaise #GIVEAWAY #WIN Spring Clean With Simple Green ~ Prize Pack Ends 5/3 http://bit.ly/hpxM9W tweet each day for one entry each ! Disclaimer: Simple Green provided me with all information and product to review. I was under no obligation to review it if I so chose. Nor was I under any obligation to write a positive review or sponsor a product giveaway in return for the free product. I follow with GFC and my cleaning tip is to use put lemon water in a dish for a minute in the microwave to loosen stuck on stuff! Cleaning Tip: I use a few Tablespoons of white vinegar in a bucket of warm water when mopping tile. The vinegar helps the water dry faster, so there's less streaking. I liked Simple Green on Facebook. I liked Simple Green on FB. follow your blog via gfc and my cleaning tip is to use a capfull of vinegar in when stripping the cloth diapers as it helps get rid of odors. I follow via gfc and my tip is to use newspaper and vinegar water to clean windows. My cleaning tip is that I use baking soda to sometimes clean my toilet bowl. Cleaning tip: Use rubbing alcohol to remove streaks from mirrors. I entered Spoonful Of Comfort. I use baking soda instead of comet on my sinks and tub! It's a gentle friendly abrasive!! I also follow via GFC!! I'm a gfc friend and my tip is to save the rinds when I squeeze lemons, then use them with a sprinkle of salt to scour counter tops.